Do you need a car but have less than stellar credit? 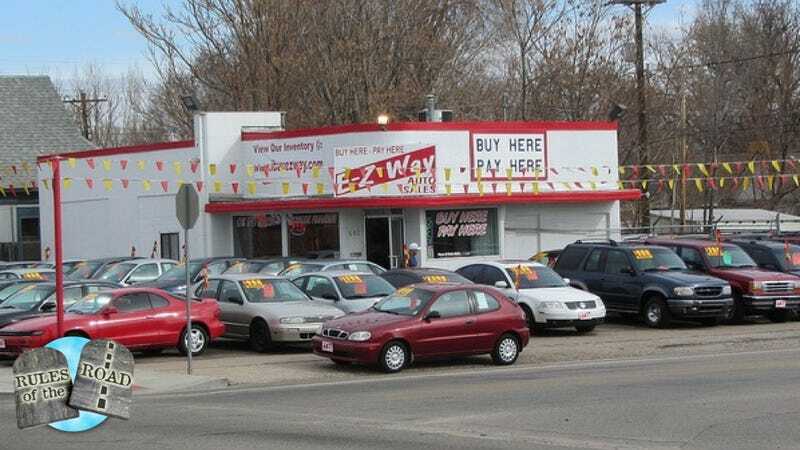 Are you tempted to buy a used car from a buy-here/pay-here lot? You need to know how these lots are different from other used car lots and that there might be help for you if such a deal falls apart. Buy-here/pay-here lots are businesses where a car seller will also lend you the money to buy a car – when you buy the car from them. They are often a last resort for buyers who cannot find financing elsewhere and these dealers often charge more for their vehicles knowing that a desperate person will take any car made available to them. Sometimes triple what a car is worth at interest rates near 30 percent. The result is often an overpriced car being sold with a high interest rate to someone who cannot afford it. It also often means a high likelihood that the vehicle will be repossessed and re-sold to someone else down the road. This dealer-financing situation can also arise when a dealer sells you a car and tells you your loan was approved – when it wasn’t. Technically, this means that the loan was never assigned to someone else and the dealer is now holding the paper. As a result, that dealer has also become the financier. Many people in dire straits who end up being entangled with buy here pay here lots assume they have no recourse when the deals go bad – as they often do. Well, there is some hope and it comes from the fact that these dealers are, in essence, now also finance companies. This means there are some more laws they will have to follow if they are to stay out of trouble. When a dealer is also the financier, it is subject to federal laws as if it was a bank making an auto loan. This means it has to provide you with Truth in Lending notifications and comply with the Truth in Lending Act. This is where it gets fun. I handle a lot of cases involving auto sales but do not spend a lot of time handling auto finance cases, so I asked a friend of mine for the nuances of these sales. Adam Alexander is an attorney in Michigan who handles a lot of cases involving automobile finance and Truth In Lending Act cases. He told me that most of these types of dealers are too busy selling cars to keep their paperwork straight on the lending aspect of the transactions. For example, the ominous-sounding Regulation Z of the Truth in Lending Act requires the financier (the dealer in this case) to, among other things: 1. Disclose that it has retained all or portions of the amounts charged you; 2. Accurately disclose the cash price of the vehicle; 3. Accurately disclose the amount financed. Sound simple? Apparently not simple enough since this rule gets broken all the time. And when that happens, the dealer/financier can be sued. Auto dealers who actually do the financing have an added requirement to provide you with a “risk based pricing notice” (RBPN), under the FCRA. 15 U.S.C. §1681m(h). This requirement is commonly missed by dealers because they don’t see themselves as banks, and literally do not understand the rules of credit when they themselves actually finance the vehicle. Why does this matter? If they missed this, they are liable for statutory damages up to a $1,000 and attorney fees. While that may not sound like much Adam tells me it almost always results in the dealer just buying the vehicle back rather than going to court and losing on this technicality. After all, they not only have to pay the statutory damages and your attorney fees if you win, they have to pay their own fees and costs as well. Most people caught up in this buy here pay here financial death spiral walk away and do nothing but bemoan their tarnished credit. Before writing this chapter of your life off and just walking away, perhaps talk to an attorney. You might find that there is a way to straighten this mess out after all.